I first laid eyes on the Jeep Renegade at the Camp Jeep exhibit in Chicago back in February. Not only did I get to see it up close, but Missi and I got to spectate from the passenger and rear seat as our professional driver maneuvered the little red Renegade through some ramps, logs, and even a 35-degree climb. It was at that point that I realized the Renegade could be onto something big. We are always excited about our test cars, but excitement would be an understatement to describe how we felt about our little Renegade, specially when we found out it was an Omaha Orange Trailhawk. I’ve read multiple reviews, watched many videos and scrolled through hundreds of photos since the the Renegade’s debut, but once our “little orange” (as I referred to it) made its way to our driveway, we had to figure out how to decode this little Jeep — is it more of a street-friendly crossover, or is it more of a trail-loving Jeep? Let’s find out! Time to get real with the Renegade Trailhawk and explore all of its features, and boy does it have plenty. This Jeep boasts lots of features and options that one would normally expect in pricier and more “grown up” vehicle, like: heated seats, heated steering wheel, back up camera, Uconnect infotainment system with Bluetooth connectivity, a large suite of high-tech safety features, and my favorite —the My Sky open air roof system. After learning about the Renegade’s charm and funkiness, it was time to get on the road and rekindle our love with a particular engine we’re already fond of. The Trailhawk model features an economical, yet stout 180-hp, 4-cylinder Tigershark engine which we previously experienced in the Fiat 500X. And although the Renegade doesn’t feel as lively or sporty as the Fiat due to its heavier four-wheel drive and Trail-Rated equipment, it’s those same bits that make the Renegade a true dual-purpose machine. Another highlight was the 27-mpg combined we achieved during our test, and given the fact that most of our driving consisted of busy stop and go commuting rather than long stretches of highway, I’d say the 9-speed automatic transmission definitely did its job. Jeep really nailed it in giving the Renegade Trailhawk an adequate drivetrain to perform brilliantly on school runs, road trips and dirt trails! On the road the Renegade is extremely smooth and feels well planted and solid. The steering is soft but very communicative (even off-road), and forward and lateral visibility is also quite good. Missi and I were both impressed with its road composure and silent cabin at low and high speeds. With a day full of driving behind us, we set out to explore the technology that makes this little Jeep one of the coolest contenders in the ruthless crossover market. Although our “little orange” didn’t feature the top of the line Uconnect 6.5 infotainment system, the 5.0 Uconnect which also refers to the size of the touchscreen (5-inches) was more than adequate, and I actually grew really fond of its simplicity and functionality. The Renegade’s Uconnect 5.0 features simple knobs for the volume and tuner, and buttons for the radio, media and Bluetooth phone functions that are big and and easy to read and push (good for operating with gloves in the winter). Although the center console may look plain at first glance, the Uconnect interface makes up for it in simplicity and ease to operate, so no need to have an IT degree to set your favorite stations. Oh, and to make sure you don’t get lost during an off-road expedition, the Uconnect touchscreen also doubles as a large digital compass (when not equipped with navigation). Cool stuff. So the Jeep Renegade Trailhawk has lots of cool features, a solid drivetrain, and easy-to-use technology, but can it baby? As you may know, I always strap my daughters Recaro or Chicco car seat into our test cars regardless if it’s a pickup truck or a sporty coupe. Why? Well, people have kids —all kinds of people, and it’s my job to find out if a particular car is car seat friendly or not. While our 11 year old doesn’t need say much about anything, our soon to be 4 year old is quite demanding when it comes to rear accommodations, so rear cupholders and AC vents are always welcomed with open arms. Unfortunately, the Jeep lacked both of those along with a rear center armrest, and even though the rear doors have built-in bottle holders in the side compartments, it isn’t feasible for a toddler to reach those while buckled in a car seat. Bummer! 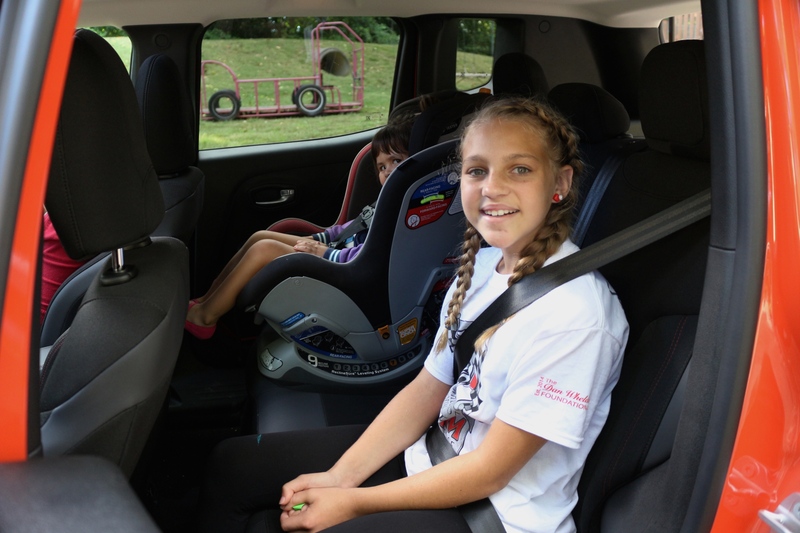 The Jeep Renegade is a small crossover and not a Dodge Durango, so one shouldn’t expect much real-estate behind the driver and passenger seats, but in our particular case, both kids fit quite comfortably and didn’t feel cramped or short on leg-room at any point. It is also important to mention that the premium cloth seats our Trailhawk was equipped with were extremely comfortable and offered lots of padding and support. Need to go camping or take the baby to the park? No problem, the trunk features a decent 18.5 cubit feet of cargo space, but that can quickly expand to 50.8 cubic feet if you fold down the 60/40 split rear seats. Once again, the Renegade offers just enough cargo space for most people’s daily needs, but don’t expect to use it as a moving van. To be fully honest with you, I don’t recall what happened on day five, so this is a perfect opportunity to share with you about the one aspect that we normally don’t get to test in a car, and hopefully will never have to —safety. My favorite day —time to go off-roading! We left the best for last and scheduled a visit to the state-of-the-art Badlands off-road park and their 800-acres of muddy fun in Attica, Indiana to make sure the Trailhawk moniker lived up to its reputation… Hint: it does. We busted out the My Sky key (which happens to be another Jeep easter egg) and fully removed the roof panels to make sure we properly submerged in the Trailhawk experience, though it also made us vulnerable to incoming mud, but I was okay with it… the girls not so much. The My Sky panels are lightweight and easy to remove and re-install, but I have to admit they are a bit of a pain to stow in their carrying bag which stores in the cargo area. Besides it’s cute looks and overwhelming charm, the magic of the Renegade Trailhawk lays in one turn-dial — the SelecTerrain dial. This dial employs some voodoo-master level witchcraft that allows the Renegade to literally tackle just about any terrain you can throw at it. Mud? No problem! Just appropriately select Mud on the dial and watch the traction control automatically shut off, the 4WD Low engage and all you have to do is hit the gas! You’ll quickly feel the rear-axle engage and help you continue your journey forward, although if you’re really in trouble, the super-saver crawl ratio will kick in and attempt to get you out of a very sticky situation. We used the SelecTerrain Sand mode to drive up some pretty steep hills and used Hill Descent Control to safely and slowly get us down some even steeper hills. And by the way, using Hill Descent Control always uncovers the perfect opportunity to scream to your passengers, look Mom —no feet! Uphill, downhill, mud, sand and even deep mud puddles were cake to the Renegade Trailhawk, and considering the factory Goodyear Wrangler tires are about as street-friendly as it gets, it makes me wonder what this little guy is really capable of with some serious off-roading rubber. Really, I’d love to find out! All in all the Jeep Renegade is not only one of the most capable crossovers we’ve ever driven, but one of the most capable vehicles we’ve ever driven. It allows you to spend some time off the beaten path, and then jump back on the highway without sacrificing performance on either end. As for me, I had the pleasure of taking my adventurous 3 year old daughter off-roading, only to drive out of the trail and take my oldest daughter and wife to the mall. Is the Jeep Renegade Trailhawk the best of both worlds? You betcha. No rear cupholders or armrest. My Sky option is pricey and quirky. Transmission makes odd sounds on 1st gear and reverse.